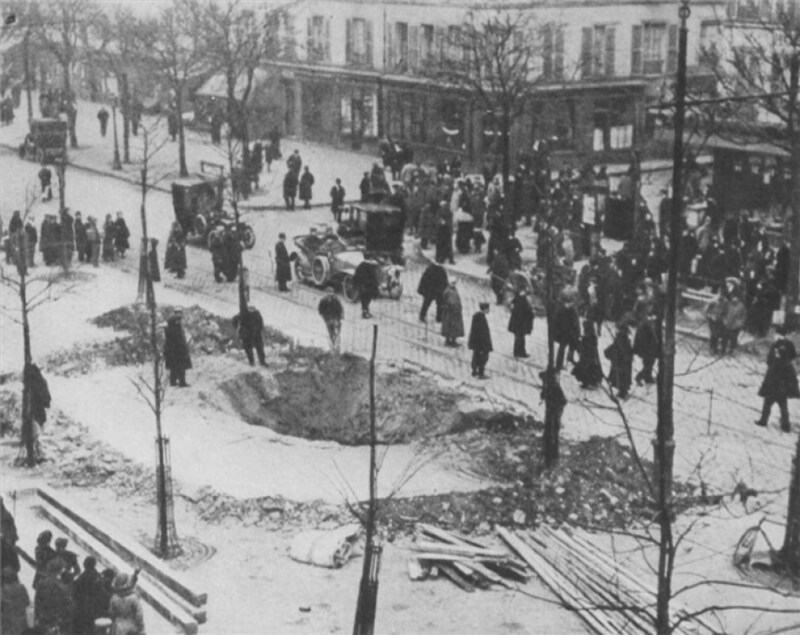 How do you save Paris from German World War I bombers? By building a life-sized decoy city, of course. Crater of a Zeppelin bomb in Paris, 1917. 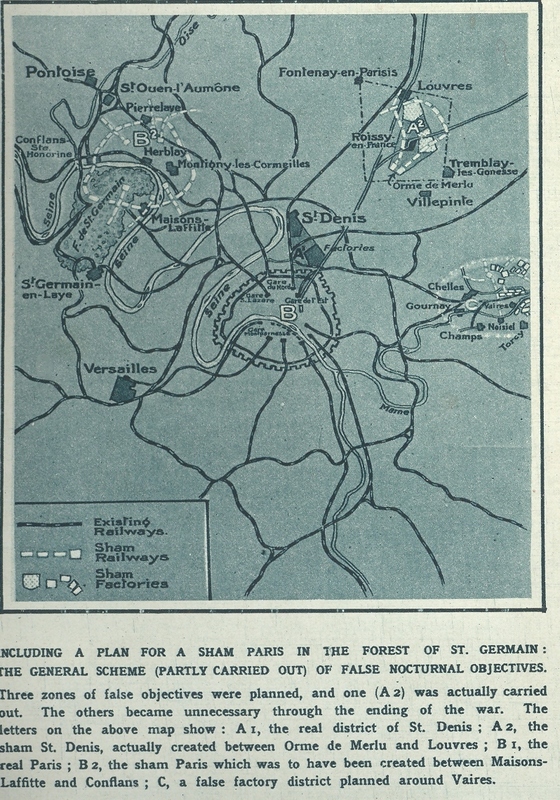 During World War I, the French created a dummy version of Paris to the city's immediate north. The plan was to fool German planes into thinking the Potemkin city was the real thing, thus leaving the City of Lights untouched by bombs. Along with a fake Arc de Triomphe, the French built a replica wooden Opera house, Gare Du Nord and Champs-Elysées. For verisimilitude, they added careful touches like translucent paint to mimic dirty glass roofs of factories. Alongside Hausmann's boulevards, they constructed lifelike industrial suburbs. Detailed map of the fake Paris 1917. 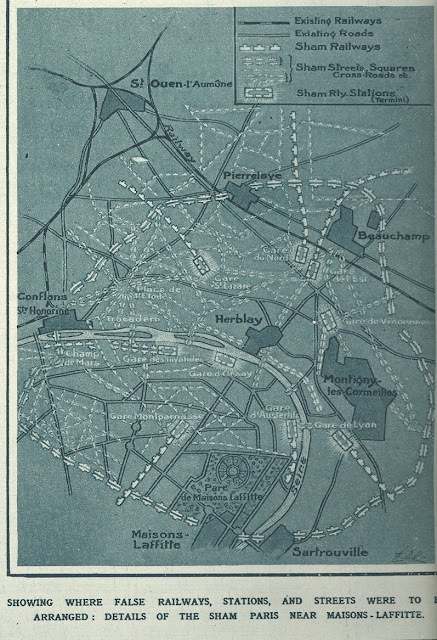 Detailed map of fake Paris 1917 with suburban area. Electrical engineer Fernand Jacopozzi, who later went on to illuminate the Eiffel Tower, was hired to create the impression of trains and machines whirring away at night with white, yellow and red lamps. The fake city, built 15 miles outside of Paris along the River Seine, was never put to use; German bombing raids ended before it was completed. Luckily, the real Paris remained unscathed. The same cannot be said for secret Paris II, which was dismantled rapidly and built over, surviving only in the pages of forgotten archives. The renewed interest in the unusual tactic is thanks in large part to Armistice Day, also known as Veterans Day. On November 11, 1918, the Allied Forces and Germany declared the end of "the war to end all wars."